The gateway to Internet content is the search engine. All the major search engines offer a SafeSearch option that when enabled prevents the searching for, or the returning of pornographic content. When we search for Internet content we use search engines like Google.com, or Bing.com, and said search engine will return a few categories of Internet content for your search. The number of categories will vary across search engines, but you will always get these three: Web,Image and Video. All Kibosh products enforce SafeSearch on Google, Bing, Ask, Info, Wow, Yippy, Go, YouTube, Backpage, and you have the option to easily block all non-SafeSearch enforced search engines. If you don’t have SafeSearch enforced you do not have comprehensive protection from objectionable Internet content. 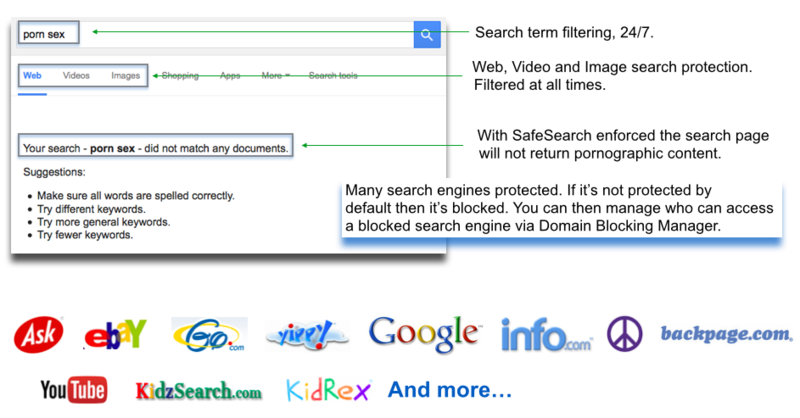 Kibosh is the only cloud based Internet content filter that, in addition to blocking bad websites, enforces SafeSearch.